Footage from the video appears to show an object falling close to Helstrup. A NORWEGIAN SKYDIVER narrowly escaped a meteorite that passed only metres away from him while jumping over Norway, according to a video aired by public broadcaster NRK. 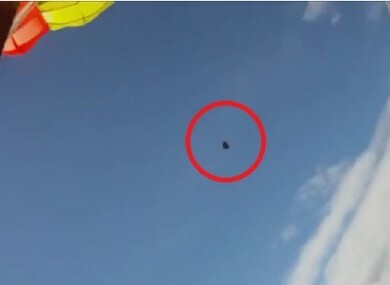 The footage, broadcast by NRK late on Thursday, was recorded by cameras fixed on the sportsman’s helmet and shows what looks like a large rock passing at very high speed near Anders Helstrup, who had just opened his parachute. “We’ve thought of all possible scenarios, like could it have been packed in the equipment? Or something falling from a plane? Or something belonging to the other flyers?” Helstrup told NRK. But at that moment, “nothing’s above me or near me,” he said. Geologist Hans Amundsen, commenting on the footage, described the object as a meteorite, in its last “dark flight” phase, when it no longer emits any light. If confirmed, it would be the first time ever that a meteorite is filmed in its post-incandescense phase. “If you’d jumped a fraction of a second later, you’d be dead,” Amudsen told the skydiver. The video went viral on social media, where experts have carefully examined it. I’m more than a little sceptical of this story, but it’s not entirely ridiculous,” astronomer Scott Manley said on Twitter. “I can’t say if it’s real or not … Seems unlikely though,” said Phil Plait, an astronomy blogger. NRK confirmed the authenticity of the footage to AFP. Email “VIDEO: Norwegian skydiver claims footage shows he was nearly hit by a meteorite”. Feedback on “VIDEO: Norwegian skydiver claims footage shows he was nearly hit by a meteorite”.